Now if you pit seven western outlaws against an army of evil looking bandits, what would you get in turn? A fresh fight? A flaming fajita? Or a f*cked up film Directed by Burt Kennedy; and Starring: Yul Brynner, Warren Oates, Claude Akins, with Fernando Rey. It was made in 1966 and lasted for 95 minutes. Ay Caramba!! Do you see those five men standing around the periphery of this sacred Mexican ruin, Amigo? Can you actually make out those five murderers and thieves I gathered from a prison, the streets, plus a gambling den? Well, there here for you, Lorca (as Emilio Fernandez). Or should I say the bullets in their rifles are here for you... if you get my gist? And we both know why that is, don't we, pal? It's because you and your fifty banditos have kidnapped all of the male farmers living in a Mexican village I once knew, and now you're forcing them into building a church to honor your dearly departed family. But I can't allow that to happen, can I? For I am your old comrade in arms, Chris (Yul Brynner), and I want you to let these farmers walk free, or else you'll get a bullet straight in-between the eyes. Then again, that's most probably why what next transpires all goes rather holy, when a local Priest (Fernando Rey) has something to say on this matter. As Vin (Robert Fuller) is very quick on the draw - Colbee (Warren Oates) finds something worth fighting for - Frank (Claude Akins) tries his best not to fall on the floor - and as push comes to shove, get ready my friends, for a two hundred man explosive war. 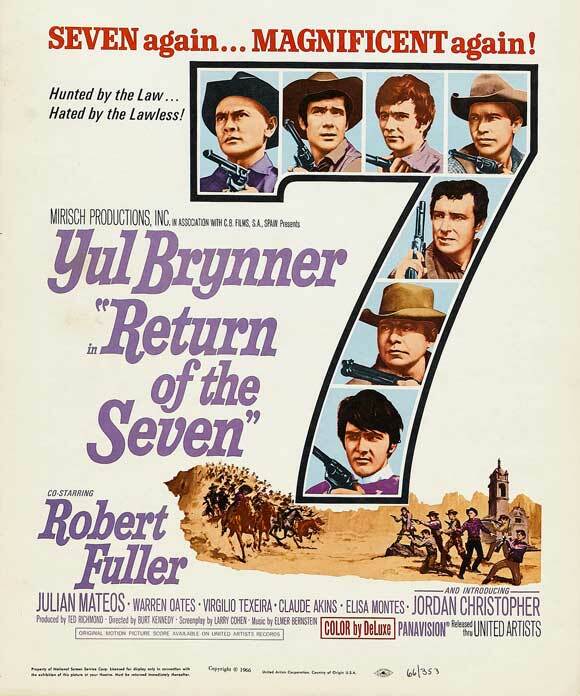 To be completely honest with you, dear reader, in my mind I find it quite difficult to review 'Return of the Seven', because I can't help but compare it to its more illustrious predecessor. Well. Let's face it. 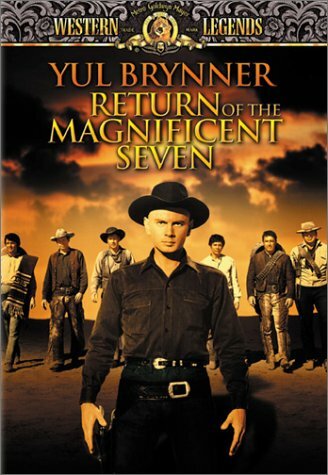 In the eyes of the world 'The Magnificent Seven' has been the benchmark western ever since it's initial release. It had a simple yet suspenseful story-line. It had a cast of colorful and memorable characters to follow. Plus to top it all off, it had the drama and the pathos, complemented by some very lavish and exciting action scenes. Now please don't get the wrong impression with what I've just said. I'm not trying to imply that 'Return' was a total waste of my viewing time. In fact, it had a number of very compelling moments scattered throughout its telling. Not only because it paid its respects to the original by continuing the exploits of Chris, Vin, and Chico. But in addition to this, it also attempted to do something new and innovative within a tried and tested format. For instance, I liked how some of the 'new characters' seen in this sequel had a similar temperament and style than their counterparts. Like how Claude Akins' character came across very much like Charles Bronson's character. Just in the way he held himself and by what he actually said. Also, I enjoyed how Warren Oates's character felt rather refreshing to these proceedings too. Cause all the way through this adventure, he literally transformed himself from a womanizing gigolo to a gunman with a heart of gold. Furthermore, something else this flick did very well at paying homage to -- even though in a more diluted fashion -- was to convey character and plot using simply constructed sentences. And it only reiterated what needed to be said in as few a words as possible. Now a good illustration of this would be in those splendid 'origin recap' scenes where 'The Seven' told Chris or the farmers a little about themselves. Granted, as I've mentioned previously, they didn't have that much of an impact compared to those similar scenes seen in 'Magnificent'. Yet that's not to say they didn't add something very personal and captivating at the very same time. Anyway. That's enough of that for the moment, folks. So stand back, and please brace yourself for the following filmic facts. (1) 'United Artists' first released this production on the same day that the director of 'Iron Man', Jon Favreau, was born -- the 19th of October, 1966. (2) Loosely translated, this project was entitled 'Seven Men Return' in Denmark; '7 a Bold Return' in Finland; and 'The Seven Brave Always Win' in Hungary. (3) The majority of this movie was shot on location throughout the Mediterranean country of Spain. This includes Alicante, Colmenar de Oreja, Nuevo Bazon, and the 'Samuel Bronston Studios', based in Madrid. 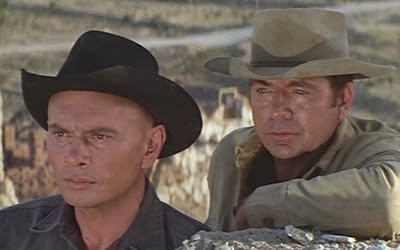 (4) One of the main reasons Yul Brynner agreed to star in this film, relied upon his co-star from the previous movie, Steve McQueen, not being involved. Steve wasn't interested though. He wasn't very keen on the plot. 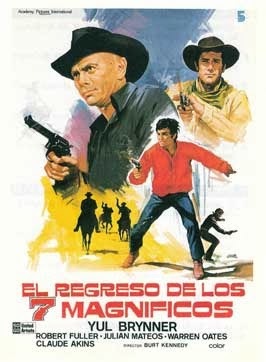 (5) Officially this was the second of the four original 'Magnificent Seven' movies. (6) In the first film Harry says to Chris before he dies, 'Well I'll be damned', only for Chris to then reply back to him with, 'Maybe you won't be'. Whilst in this film, the last thing Chris says to Vin before they leave the village is, 'Well I'll be damned', only for Vin to then say in turn, 'I doubt that. I doubt that very much'. (7) In that scene where Manuel kills the bull, you might notice that its dead carcass isn't seen in the pen once this deed is done. Ops! Continuity glitch. (8) Despite Elmer Bernstein receiving an Academy Award nomination for his film-score, I'm sorry to say that the film in itself was heavily panned by the critics. Heck, even 'Variety' called it "unsatisfactory, plodding, and cliché-ridden". 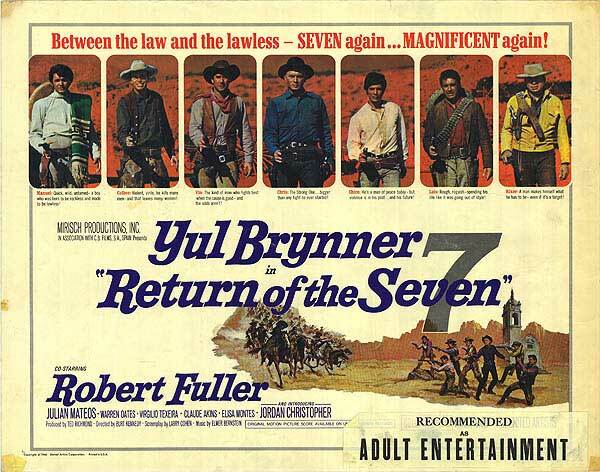 Overall 'Return of The Seven' was a pretty decent film. The story-line was relatively nice to follow. The new and old cast of characters did well with what they had at hand. And at the end of the day, the only thing that let this movie down was that it wasn't as magnificent as what came before it.